Grand Central Publishing, 9780446676939, 240pp. As mothers today we are faced with a daunting list of responsibilities. How easy it is to simply rush headlong through our lives, slaves to our daily obligations, and in the process race our children through their childhood. But there is a better way... 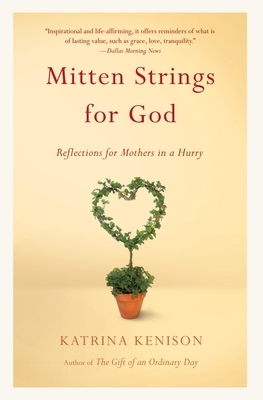 In Mitten Strings for God, Katrina Kenison shares her own search for a more satisfying balance in her life. The result is a lyrical and tender series of reflections, interwoven with gentle suggestions and advice, that remind us what happens when we slow down and are fully present in our lives. Suddenly there is room for joy and play and intimacy, space for wonder and reverie, and time to awaken to the beauty of the world and discover the sacred in the ordinary. Tranquil in our own hearts and minds, we can offer our children the one thing they need more than anything else: us. And we receive something priceless in return-the chance to savor our lives and the precious people in them. Katrina Kenison is the author of The Gift of an Ordinary Day: A Mother's Memoir (Springboard Press, 2009). She has appeared on Oprah and other shows. Her writing has appeared in O, Real Simple, Family Circle, Redbook, Better Homes and Gardens, Health,and other publications. From 1990 until 2006, Kenison was the series editor of The Best American Short Stories, published annually by Houghton Mifflin. She co-edited, with John Updike, The Best American Short Stories of the Century (Houghton Mifflin, 2000). She wrote, with Rolf Gates, Meditations from the Mat: Daily Reflections on the Path of Yoga (Random House, 2002).